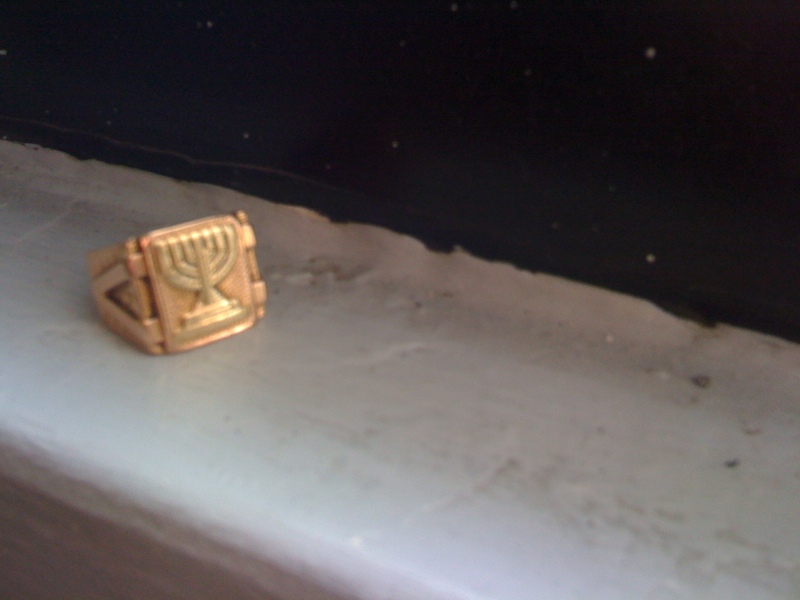 I got my gold menorah ringfrom my grandmother after my grandfather died. It was given to him by his cousin from Israel after WWII. My grandfather spent years in Auschwitz where he lost his first wife, daughter, parents, and 10 brothers and sisters. In 1956 my grandfather’s cousin emigrated to Israel and my grandfather emigrated to the US where his cousin later came to meet him and brought the ring as a present. My grandfather was in the army in Hungary leading up to the war. On Yom Kippur, a Jewish day of fast, my grandfather’s proto-Nazi unit was running rigorous training exercises but he refused to give up the fast. At the end of the day, he collapsed close to death on his bunk so the commanding officer came into the barracks to deal with the situation, screaming at my grandfather, demanding to know why he hadn’t eaten. After learning that my grandfather had collapsed not because of his weakness but because of his faith, the commanding officer took him out for shots of whiskey and later helped my family both during and after the war. True story. My ring is pretty much as close to a super power ring as I can imagine. Alan Astor makes music with the band Punches.